Our exclusive Pacific SmartWall® system is exactly that – smart by design and construction. A Pacific SmartWall® minimizes thermal bridging; this is the amount of wood that acts as a bridge between outside and inside temperatures. By reducing the amount of wood that can act as a thermal bridge the Pacific SmartWall® insulation performance is far higher than a conventionally framed 2×6 wall. This is achieved by thermally breaking the framing components where possible. The insulation is actually routered into the wood. Heat loss within the wall cavity is virtually eliminated and a more constant R value is achieved. Additionally, in a Pacific SmartWall® the ‘dew point’ is eliminated, greatly reducing the possibility of moisture buildup within the wall cavity. In a conventional wall warm moist air permeates through the wall cavity from warm to cold. The moisture in this warm air then condenses when it meets the colder part of the wall – typically 2/3 of the way through a conventional wall. This can potentially cause problems. Pacific SmartWall® was tested for a full year at BCIT’s Cold Weather Testing Facility. 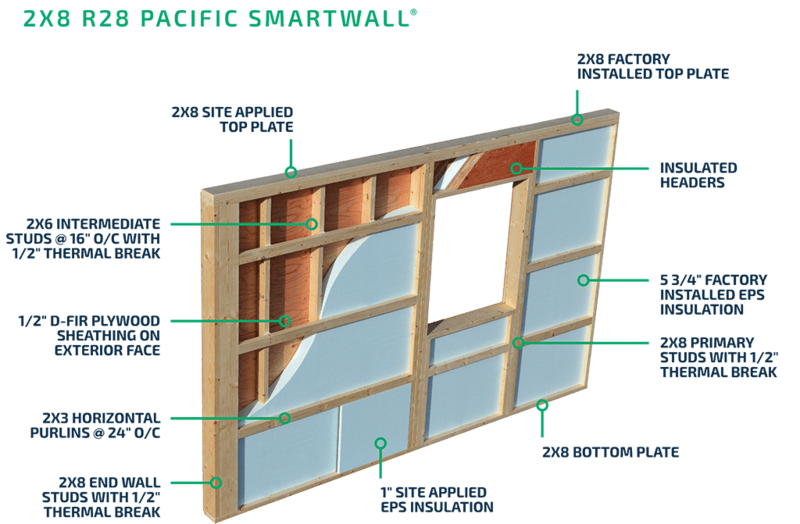 Pacific SmartWall® demonstrated superiority in terms of both energy efficiency & reducing moisture build up over time when compared to conventional framed walls. Contact Pacific Homes for more information on our Pacific SmartWall® or to arrange a factory tour to see it being built.